The exhilarating story follows a group of friends in a small Ohio town who witness a catastrophic train crash while making a super 8 movie. When they realize that it was no accident, they set out to find the truth--something more shocking than any of them could have imagined. Combining action, humor and heart, the film features outstanding performances from a fresh young cast including Elle Fanning (Somewhere), Gabriel Basso, Zach Mills and newcomers Joel Courtney, Riley Griffiths and Ryan Lee, along with veteran actors Kyle Chandler and Ron Eldard. HOLLYWOOD, Calif. (September 15, 2011) - Called "a mind-blowing masterpiece" (FOX-TV), writer/director J.J. Abrams' (Star Trek) breathtaking adventure Super 8 debuts in a Blu-ray(TM)/DVD Combo Pack with Digital Copy November 22, 2011 from Paramount Home Entertainment. Produced by Amblin, Bad Robot and Academy Awarda winner* Steven Spielberg, the exhilarating story follows a group of friends in a small Ohio town who witness a catastrophic train crash while making a super 8 movie. When they realize that it was no accident, they set out to find the truth--something more shocking than any of them could have imagined. Combining action, humor and heart, the film features outstanding performances from a fresh young cast including Elle Fanning (Somewhere), Gabriel Basso ("The Big C"), Zach Mills (Kit Kittredge: An American Girl) and newcomers Joel Courtney, Riley Griffiths and Ryan Lee, along with veteran actors Kyle Chandler ("Friday Night Lights") and Ron Eldard ("Blind Justice"). 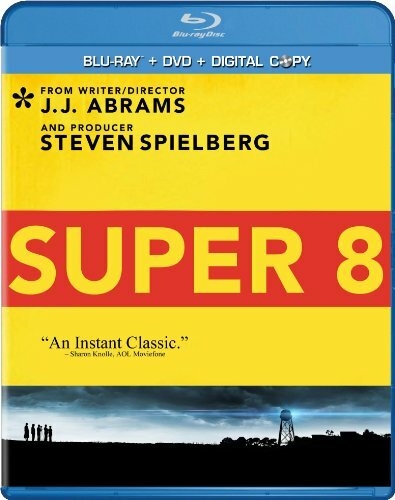 The Super 8 Blu-ray/DVD Combo Pack with Digital Copy includes more than two hours of enthralling special features including eight behind-the-scenes featurettes exploring the origins of the story, the casting, the locations, the music, the impact of 8mm film and more; an in-depth deconstruction of the breathtaking train crash; interviews with cast and crew including J.J. Abrams and Steven Spielberg; deleted scenes; and commentary by J.J. Abrams, producer Bryan Burk and cinematographer Larry Fong. Super 8 will also be available as a single-disc DVD.
. Do You Believe in Magic?